The Permian basin has garnered much of the media attention when it comes to U.S. shale growth, but higher oil prices are putting more shale regions into profitable territory. 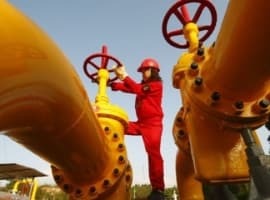 In years past, shale companies trumpeted their diversified holdings, noting their foothold in multiple shale basins in disparate parts of the country. 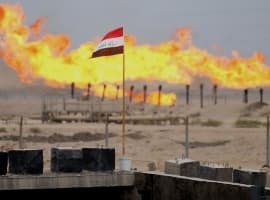 However, that started to change when oil prices cratered to as low as $30 per barrel. During the depths of the oil market downturn, U.S. shale production dipped but quickly rebounded, aided by soaring output from the Permian. While places like the Bakken and Eagle Ford struggled with oil prices below $50 per barrel, drillers could still make it work in the Permian. Shale companies large and small began shedding assets in undesirable locations in order to focus on the Permian. The Williston basin (which includes the Bakken) saw its rig count hit a recent low point at 45 at the start of this year, but the region has added 12 rigs since then. 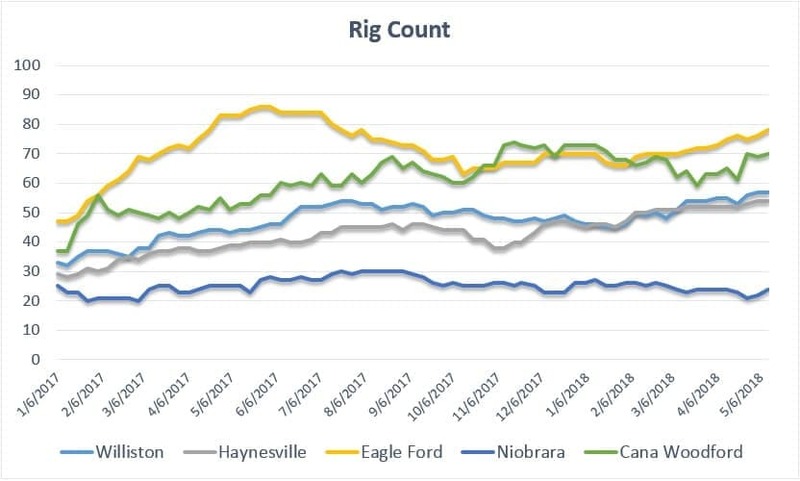 The Eagle Ford also saw the number of rigs dwindle over the course of 2017, before rebounding in February, adding 12 rigs in the past three months. More importantly, higher levels of drilling are helping to revive flagging output in these areas. The Bakken was thought to have peaked at 1.26 mb/d at the end of 2014, but it is now close to surpassing that high point – production in the Bakken is expected to rise to 1.238 mb/d next month after bottoming out at 0.956 mb/d in December 2016. The best days for the Eagle Ford were also thought to be in the past, hitting 1.7 mb/d in 2015 and declining since then. However, after bottoming out at 1.048 mb/d in August 2017, the South Texas shale field has rebounded to 1.353 mb/d. 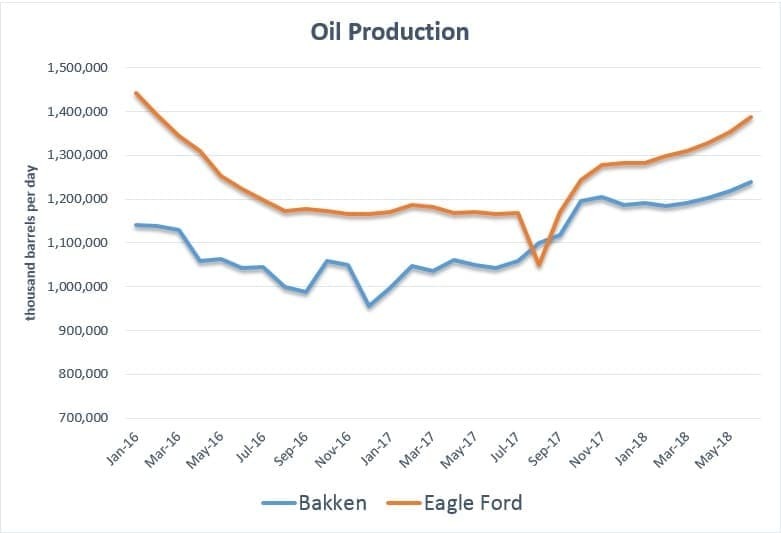 But the rebound in the Bakken and Eagle Ford, among other shale regions, is not just the result of higher oil prices, although that is a major part of it. Shale regions across the country are also benefitting from the bottlenecks that have struck the Permian. The constraint on fracking crews, labor and other drilling services are pushing up costs. The concentration of activity has also pushed land prices through the roof. Most importantly, pipelines are filled to the brim, which is leading to discounts for oil in Midland that recently surpassed $10 per barrel. That is leading to a unique situation in which some less fortunate companies are having trouble moving their product while others continue to ramp up. “We expect the market could witness the development of haves and have-nots in the broader Permian Basin for takeaway and basis risk management and believe this is a significant looming differentiator,” Anadarko’s CEO Robert A. Walker said on an earnings call in early May. 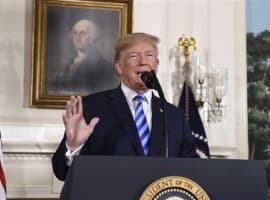 In other words, shrewd drillers locked up available pipeline space to carry their oil to the Gulf Coast, while those companies that have failed to secure pipeline capacity could suffer serious discounts for their product. Ultimately, companies are going to have to diversify into other shale basins. Just as in the recent past E&Ps tried to sell their “pure play” exposure to the Permian, now more drillers are once again talking up their diversified holdings. With the Permian already very crowded, capital and rigs will spill over into other basins. Just when we thought the Permian was the only play in town! The more things change . . .